John's of Times Square has partnered with Madame Tussauds Wax Museum to offer the Ultimate NYC Experience! Guests will enjoy one hour of unlimited pizza and entrance into Madame Tussauds for as low as $39.60 per person! 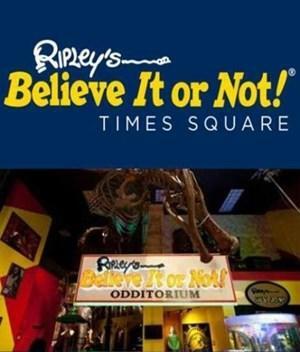 John's of Times Square has partnered with Ripley's Believe It or Not! to offer the best deal in Times Square! Enjoy unlimited salad, pizza, and soft drinks at John's and entrance into Ripley's Believe It or Not! for as low as $35.75 for students!